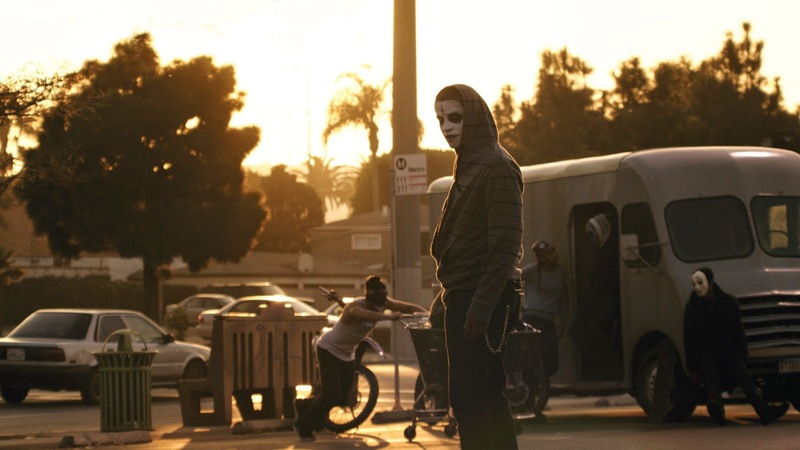 In the first few minutes of THE PURGE: ANARCHY, the sequel to last year's equally contumacious horror, The Purge, a message materializes on the screen that describes the dystopian events we are about to see: the nation's annual night of mayhem is about to commence, in which there will be no lawful interference. People are encouraged to exercise their legal right given to them by "The Founding Fathers" and "purge" the undesirables--specifically "the poor." Right away this incites an unsettling feeling that begs the following questions: Who decides who's poor? What level of destitution marks someone who should be eliminated? How do you locate the targets? It's these nagging questions that pester this second installment which at its best is a hauntingly plausible look at an apocalyptic future, but at its worst never quite embraces the issues it promises to explore. Instead, the film swings between both pendulums without ever landing on a secure foot. We learn early on in the film that a rebel group, strikingly consisting mostly of African-American men, has formed to reclaim their place in society, and retaliate against the so-called elitist group of individuals who most benefit from the purge. Which is interesting since, while the first film touched on these sociopolitical issues, it never explored them. There was no armed party to stand up against the gang purgers, so everyone was at the mercy of those who purged (a more controlled concept). Now we have this opportunity to show an actual war, where everyone has taken the law into their own hands, and in which two distinct sides actively fight to survive. Even better, the action takes place outside in the streets where there is limited refuge and the stakes are higher. But all that potential goes to waste because writer/director Jason DeMonaco again chooses to focus on the helpless victims of the night, to the disadvantage of far more interesting characters and a more advanced story that could have built off the last film and personified its title. So THE PURGE: ANARCHY isn't actually any more anarchic than the last film. By centering on these tedious individuals that get caught out in the night, we get a very similar story from the first except that the action takes place outside which makes the story more erratic (though the new setting effectively enhances the suspense, creating an overwhelming sense of vulnerability). Additionally, some of these target victims are mind-numbingly annoying. While Frank Grillo's insurgent hero is an intriguing character to watch (and Grillo does a good job with it), the film's two main female characters are unforgivably weak. 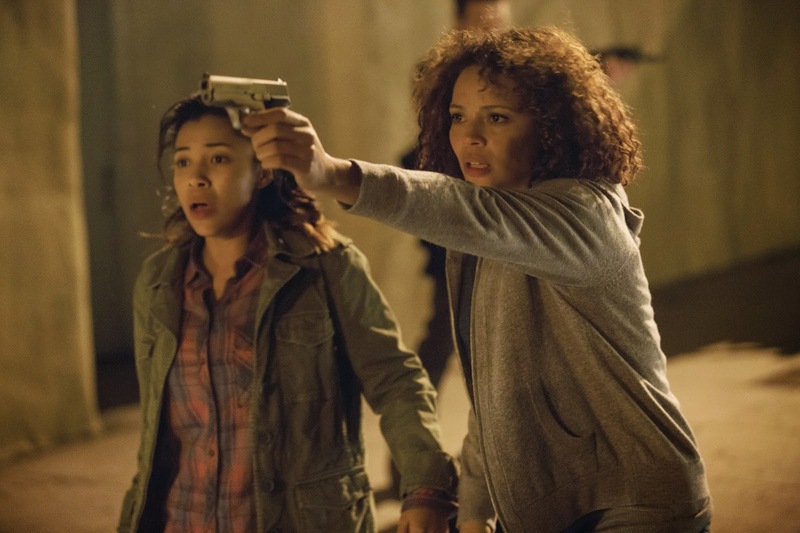 Carmen Ejogo's Eva is a the epitome of a damsel in distress: she cowers at every rap on her apartment door, and for some inexplicable reason she never asserts any authority around her annoyingly loquacious daughter, Cali (Zoë Soul). So much so that I didn't even realize she was her daughter at first. Eva is always jittery, has fright in her eyes, and barely speaks above a whisper. So you can just imagine how she reacted when she and her daughter were pulled out of their homes after their (you guessed it) security system falls apart within minutes. Eva whimpers the entire time, while Cali tries to talk everyone to death (apparently that is her purge power). It's a strange dynamic, especially when it's lined up against Grillo's more self-aware character, and that of Liz and Shane (Kiele Sanchez and Zach Gilford) who play a couple on the brink of separation. But actually, all of these characters could have used more development. Grillo's Sergeant has a back story we never learn until the end of the film, in a series of hyper chaotic events. We learn that Eva and Cali are specifically targeted, but that fact is not ever revisited again. But the biggest display of randomness is when the group of protagonists seek refuge in a friend's home, which becomes an incestuous war zone. Why? Because the film told us at its very beginning that the purge is about the rich getting rid of the poor, the elite human race getting rid of the weaker one. So how does a domestic squabble enforce these objectives? Why when one of the gang purgers captures the group, he sends them to a more disastrous situation where they have to fend for themselves (and therefore does not act on his "God-given" right)? There are several times throughout the film where we are led to believe that the main group of characters are specifically targeted, but we never learn why. Eva and Cali live in a rundown apartment building, so we can assume it's their economical status that makes them vulnerable. But what about Liz and Shane--why are they targeted? These questions all lead back to my main point that the film should have focused on the rebel uprising instead. To push this group into the background is a major flaw that is emphasized in the film's penultimate act that features a pivotal and terrifically executed scene with the rebels, reminding the audience that it is they who should have been the main characters all along. DeMonaco's knack for creating anxiety and tension is excellent and provides genuine horror (the idea of actual anarchy with no legal repercussions is still terrifying), but he could have used some help in the writing. I'm completely on board with the horror action, but this sequel really points out the glaring thematic flaws. Hopefully that is tightened up in the inevitable third installment (approximately 364 days away). THE PURGE: ANARCHY is in theaters Friday. Is there a reason you felt qualified to review the film without watching it?